Nondiegetic Musical Themes And Textures. “Indeed, the celestial voices of film music do resemble a phantom in several significant ways. They are ephemeral, they are not ‘substantial’ or do not constitute part of what audiences cognise as important in the film, and have an effect that is not apparent.” – Donnelly (p.8, 2005). Though looking at nondiegetic scores for the BBC Ghost Stories may not at first seem relevant for this section of the essay, the analysis of their sparse but effective use of music is essential in theorising a tie between its effects and the tradition of recitation. The music in these films acts as several different types of signifier, varying from story to story, though all have one general aspect in common; the music is deliberately uncomfortable in order to create dynamic tension. How can this aspect be related to the receiving of the story through the human voice? Both directors in question have related childhood memories of being read M.R. James’ stories by their parents as well as possessing knowledge of the original context in which these stories were told. There is no doubt that when James read them to his Chit-Chat Society in Cambridge or when parents read them to their children, they dramatised them rather than simply reading them out in a plain fashion. 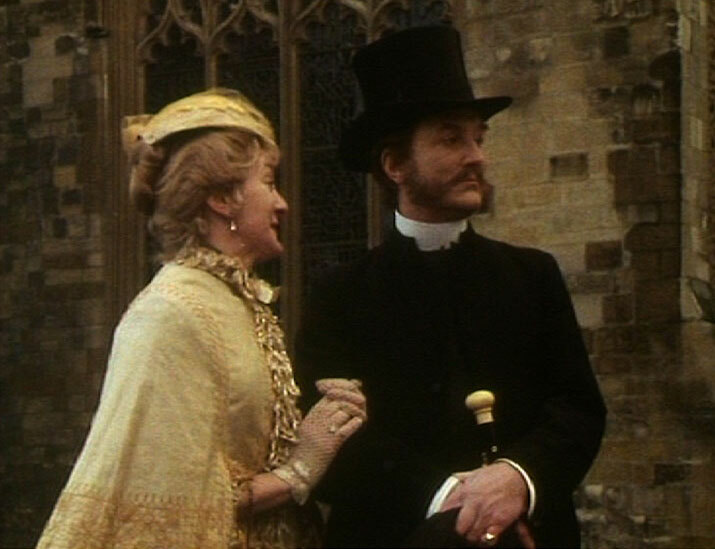 Oliver backs this up, stating “James was, by all accounts, a fine actor and mimic and his performances on these occasions were spellbinding.” (p.15, 2012). This element of drama, perhaps involving different speeds, intonations, and voices, will have coloured the stories, heightening their various scenes in the same way that dynamic instructions can do for music. This aspect has a clear parallel with nondiegetic scoring, it being the closest equivalent in the traditional telling of these stories to the music in their subsequent adaptations because of their joint effect in adding dynamics to the narrative. In spite of this, Miller doesn’t use any music whatsoever in his adaptation, whose emphasis on natural sound will make up the body of the next section’s analysis. Instead we return to Lawrence Gordon Clark’s adaptations which use various different types of music to convey a sense of haunting, paranoia, and also narrative leitmotifs. This seems a natural trait for the ghost story with Donnelly in particular finding much phantasmagoria in film music’s presence as a whole: “I think we might also characterise non-diegetic film music as being a device related to a ghost or spectre on screen.” (p.20, 2005). For the first three of his adaptations, Clark would rely on what he would later refer to as “stock music”. This, he claims, was simply down to a lack of budget; a problem that would gradually diminish by 1974’s The Treasure of Abbot Thomas. The description of “stock music” perhaps suggests something rather dull but research reveals that much of the music used is classical, avant-garde work. “Indeed, the director has always been vocal in his belief that both McGlashan’s atmospheric photography and Manton’s distinctive and memorable soundtrack are as responsible for the potency of A Warning to the Curious as his own contributions, a viewpoint even the most casual viewer would find hard to discount.” (p.9, 2012). While its visuals are indeed memorable, the sound is far from emphasised in the context of other BBC Ghost Stories. Instead, it is this amalgamation of music that is its most memorable aural aspect. A high-pitched atonal note is held, whilst lower sounding strings give a rumble of something nasty lurking beneath the aural surface throughout, almost as a leitmotif for Ager’s ghost which is unpleasantly ubiquitous. During the film’s two chase sequences, the latter ending in Paxton’s violent death at the hands of the ghost, Clark uses moments of Atmosphères‘ more dynamically inclined textures to perhaps provide the inner turmoil for the character of Dr. Black (Clive Swift) who is witnessing this chase but is also constantly losing sight of his friend and the creature as they run through a coastal forest. As the visual of the two men running is obscured by trees, Ligeti’s music abruptly stops as if the horror is only recognisable to the character of Dr. Black when he can visually perceive it. There’s no doubt that when James related the final chase of the original story, he was just as abrupt and dynamic with his performance and sentence structure. “Almost as chilling as his violent, undeserved demise at the hands of William Ager is the revelation at the end of James’ tale that Paxton is entirely alone in the world. The inquest into his death fails, we are told, because the young man ‘was so entirely without connections that all subsequent inquiries that were made ended in a no thoroughfare. '” (p.14, 2012). The melody line is played on the lower register of a flute and works well as a subtle but not overtly important element in bringing out the sadder aspects of the character (he is after all there to get the crown because he has recently lost his job). This analysis seems somewhat ironic considering that Clark himself stated “I was trying to make a silent film with A Warning To The Curious…” (2012). The musical use and potential readings have been somewhat underestimated here by the director. “Reflecting Paxton’s isolation in the early parts of the film is the sombre unaccompanied flute soundtrack which, by the climax, has become a jagged, violent score of wild, flailing notes over barking strings. ‘I used to sneak down to Edgon House, which was a BBC building just off Oxford Street’ Clark recalls, ‘and raid the music library! I had great fun finding the music for the ghost stories, you could uncover all kinds of weird and wonderful things down there that were hiding away on a shelf. '” (p.20, 2012). The melody can be seen in this case to represent Stephen’s youthful, isolated innocence, perhaps even naivety towards his cousin’s strangeness and the increasingly frequent appearances of two unexplained children. Hyperion III also provides the more atonal elements for the various supernatural occurrences; this seems to be a set norm for Clark who, even when working with composers making music specifically for his later ghost stories, uses atonal and dynamically eccentric musicality to represent the appearances of ghosts. In a later, unnerving montage, the children are seen in the distance in different shots but each time gradually getting closer to the house. For this scene, he employs a similar single note ambience from Hyperion III, drawing together the disparities and building very gradually to, what is to be, a horrific climax. Other music also finds its way into Lost Hearts, the film being the most musically inclined of all of the BBC Ghost Stories. It perhaps also links in with the fact that it was only James’ second performed ghost story; the first reading of his side project was likely to have had to have been more dynamically dramatic simply because of its sociological unusualness. When recalling the history of the two mysterious children, both are given musical backgrounds as well sociological ones. The girl (Michelle Foster) is said to be a gypsy or at least “have gypsy blood”. She is shown to enjoy dancing and singing and her “gypsy background” influences her musical leitmotif which is a folk rendition of the traditional song, Minstrel For Clare. This sort of leitmotif use is brief but effective in sketching out characters who have very little screen-time to allow for a back-story. It also provides a useful contrast to their aural, ghostly forms that are presented with a style far from the joviality of the folk leitmotifs here. This style continues when Stephen is also given a brief moment of musical sketching, showing him flying a kite in the windy fields of the house to the sound of Ralph Vaughan Williams’ English Folk Song Suite. The scene again emphasises the character’s youth which is a vital theme to the story and its dark drive towards a sacrifice. ” “He were a foreigner – Jevanny he called hisself – and he come a-tweaking his ‘urdy-gurdy round and about the drive one winter day, and mast ‘ad him in that minute, and ast all about where he came from, and how old he was, and how he made his way, and where was his relatives, and all as kind as heart could wish.” ” (p.25, 1931). The song he plays is a version of L’amour De Moi and it becomes an omen for his presence. 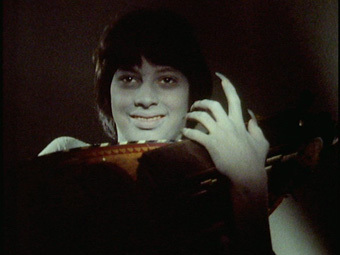 In one scene, Stephen is almost hypnotized by the sound of it; the ghost of the boy playing and giving a leering smile before revealing to him that he has gruesomely had his heart cut out. Though it is an idea brought over from James’ original story, there is a clear naturalness to such music’s presence as Link suggests: “Music boxes and other mechanical music therefore becomes particularly effective in child-related horror. Their unknowing demeanour mimics innocence.” (p.46, 2010). When Mr Abney becomes suspicious that the children he has already murdered are trying to warn Stephen of his potential fate, he takes the hurdy-gurdy and burns it. Yet, in the final haunting where the children exact their revenge, the hurdy-gurdy music of L’amour De Moi is heard, becoming a final signifier of vengeful ghosts who are after their murderer’s heart. The music, in spite of being a happy tune, becomes a disturbingly light-hearted sign of the presence of dead but revenge-seeking children. “Wells Cathedral has a friendly enough atmosphere but with careful selection (I storyboarded the entire film) and the genius of John McGlashan’s lighting and Geoffrey Burgon’s chilling music (plainsong and the whirring of bicycle chains) we managed to turn it into the doom-laden gothic abbey we needed.” (p.74, 2013). “I used the choir of Norwich Cathedral (where we made the film) singing the canticle ‘Oh Lord now lettest Thy servant depart in peace according to Thy Word’. It played over scenes of the routine of clerical life in the cathedral close, including repeated celebrations of the old man’s birthdays, and his cheerful ‘Good morning, young man’ to Haynes as he emerged from the archdeaconry as they made their ways to the cathedral until he was violently removed from the scene by his accident on the staircase.” (p.18, 2013). However, Clark’s most effective use of music comes from his nondiegetic scores and the serendipic use of music from the BBC archives which heightened the sense of dread built up for some of his most startling recreations of the supernatural. With analysis, it is clear that their dynamic inclinations and uncanny usage is a partial evolution of the recitation tradition though is perhaps an aesthetic aspect whose presence is greatly enhanced by the original narrative contexts rather than simply being uniquely born from them. A Musicological Study of Ken Russell’s Composer Films – Part 7 (Pop Aesthetics).